So the colder weather today got me thinking of Fall Fashion. 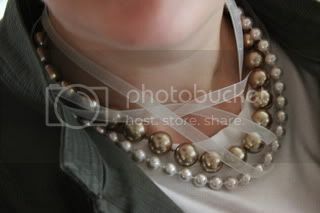 Upon searching fall fashion trends(ok I can hardly keep from giggling, admitting I actually did this)it turns out that pearls are in this fall. Not your plain grandma's pearls but the layered look. 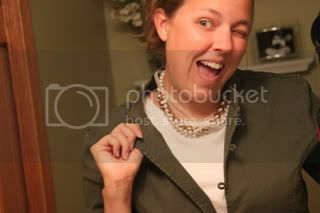 Yet the multi-strand pearl necklaces I have found are anywhere from $20 to $500 not exactly what this mommy wants to pay. Even $20 for this thrifty mommy can be spent better. What if I told you you can create the same look $5? Now that I can do. Two strands of pearls (approx the same length) Thrift store $1.50 each. There are usually plenty of lonely pearl strands to choose from. Total: $5 (but I can use the leftover ribbon for other projects. Take your necklaces and line them up. You want to have one clasp on one end and the other clasp on the other. Hook the end of one necklace to the end of the other so you have one necklace. If you are a jewelry maker, you can open a jump ring sideways and connect them that way but for a quick anybody fix you can just hook them together with the clasps. 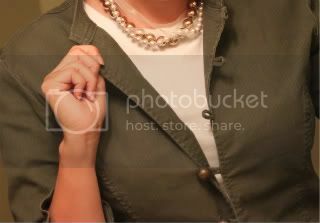 Then you take your sheer ribbon and cut three strands that are a bit longer than your necklace strands. 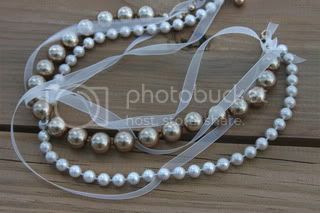 Tie the ends of the ribbons inside a loop if there is one, or just around the necklace between two pearls. This adds another layer to the necklace. Grey tones, for jeans, jackets and sweaters. I love the necklace! What a cute (and thrifty) new piece to add to your jewelry. 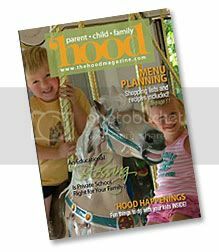 I'm gonna have to make me one of these! I'd love for you to come share this at my link party this weekend. Hope to see you there! 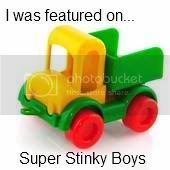 Just wanted to let you know I featured this! I am so smitten with it! Awesome work! Layered pearl necklaces have been a hot trend for the past years, but it’s definitely fun to see them adding more materials. This necklace offers a modern and fresh look. 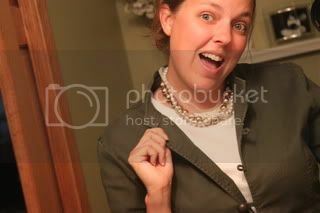 The great thing about this look is you can create your own version, even using inexpensive faux pearl strands. Thanks a lot. 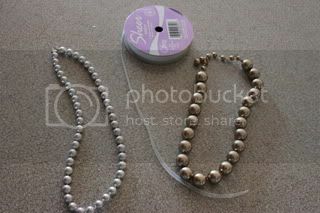 The great thing about this look is you can create your own version, even using inexpensive faux pearl strands. Don’t want to go plastic? Fresh water pearls are a lot cheaper than the tropical version but still count as “real” pearls.